PLAINVILLE – A portion of the Farmington Canal Heritage Trail recently completed in Cheshire features Michaela’s Garden, established in memory of Rep. Bill Petit’s daughter, and showcases her beloved four o’clock flowers. The “Cheshire gap” in the trail was closed last week as that portion of the multi-state trail was completed. Along the route can be seen several rain gardens and flower gardens. Among them is Michaela’s Garden, which the Petit Family Foundation planted to honor Michaela’s memory. Petit said that his daughter had a great fondness for four o’clock flowers, which are also known as the children’s state flower. The flowers are expected to bloom in mid-July. 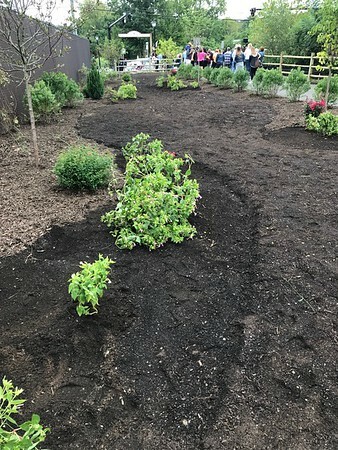 The Petit Family Foundation has also planted gardens at Plainville Library, Linden Street School and Walnut Hill Park. Petit said he was “very pleased” with the addition of Michaela’s Garden to the bike trail. The placement of the garden, he said, is not far from his former home, where he once lived with his late former wife, Jennifer Hawke-Petit and his daughters, Hayley, 17 and Michaela, 11. The Petit Family Foundation, like Michaela’s garden, was created to pay tribute to Petit’s family and to support causes which they cared about. The Plainville-based non-profit is dedicated to fostering the education of young people, especially young women in the sciences, improving the lives of those affected by chronic illness, and supporting efforts to protect and assist those affected by violence. Thanks to the help and support of friends, Petit was able to rise again from the ashes of his loss to start a new life and help make a difference in the lives of others. He re-married and 2012 and has a son, Bill Petit III, with his wife, Christina Petit. Petit ran successfully for office in 2016, representing the 22nd General Assembly District which includes Plainville and New Britain. Through the Petit Family Foundation, which holds an annual road race and an annual golf tournament, Petit was able to award close to a half-million dollars in grants, sponsorships and awards in 2016. Posted in New Britain Herald, Plainville on Sunday, 23 September 2018 17:48. Updated: Tuesday, 25 September 2018 13:02.